There are times that I needed to know the value of an inductor out of my junk box or build an inductor of my own. I do have an Almost All Digital Electronic L/C Meter IIB. This meter is a joy to use and has serve me well over the pass ten years. If you are looking at this article and want to built a nice piece of gear, instead of paying a lot for one of the commercial pieces of please read on. I have always enjoyed relearning things that I learned years ago!!!! I think all of us have those moments. I am not sure why I feel that I need to review the basics but that is OK. 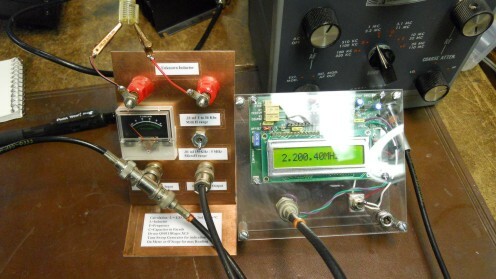 The January QST 2011 had an article from Bob Rogers, WA1PIO building a test fixture to determine the value of an inductor. You can measure the value of an inductor by paralleling it with a known capacitance and measure the resulting resonate frequency. This kind of goes back to the old days when we used grid dip meters to determine the resonance of circuit. As Bob indicated, it is getting harder to find grid dip meters and to really know how to use one. If you get the coupling of the grid dip meter with the tune circuit wrong you could get a false reading. This setup that Bob did is really a lot more reliable. The circuit that I built, I also added a meter. I started off using multiple signal generators that I had in the shop. My best signal Generator is a HP-8640B. When I tried to test my first unknown inductor I realized that my generator did not go below .455 meg hertz, and I needed a generator that would go down to 1 kHz. I still tried to use the HP and also realized that the internal meter would not read. I thought I had some something wrong with the circuit or the signal diode that I used. The 1N34 diode is a germanium diode that will rectify a voltage down to .3 volts. So I turned the output of the HP generator to +20 dB and the meter did work some. 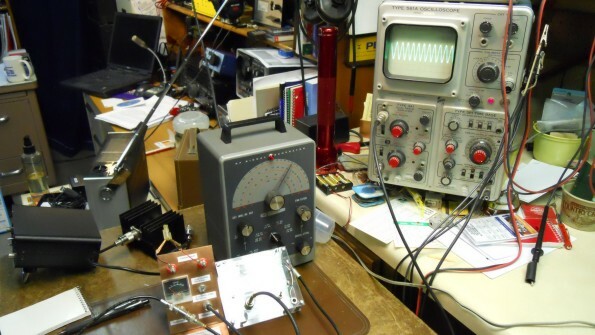 Through my first tests I used the oscilloscope to find resonance. It really worked well to some extent. After rereading Bobs article I realized that he was using a B&K 4040 that has a higher output of 10 volts. So he was using a generator that you would normally not have in an individual shop. I looked at the B&K website and that generator is $650. That would really be outside of my budget. I have a couple of old RF generators from the 50's through the 70's. I knew that these generators would not have a high enough output to work with the internal meter. It should work as a RF source and I would see the same results using an oscilloscope or a RF Meter (the RF Power meter that I built using Wes Haywards design). The RF generator that I picked is an old Heathkit Model IG-102. I tried the knobs and the band switch was locked. That's how long ago I used it. I got the band switch working and realized that I did not have any output. It always seems like I have to fix some of my equipment before I can make any progress. I had broken a wire going to the main tuning capacitor from flexing the band switch. The inductor tester has a switch that provides us with three settings. Placing the switch in the down position selects the 0.01 microF capacitor supporting measurements of inductors in the microH range using a signal generator with a 159 Khz to 5 mH range. 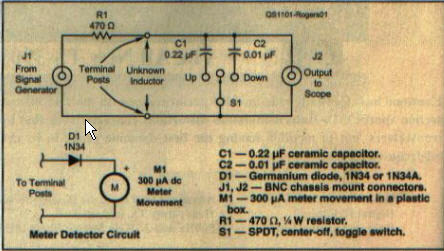 Having the switch in the up position selects .22 MicroF capacitor that is used to measure larger MicroH inductors, using an signal generator frequency in the 1 to 34 kHz range. With the switch in the middle position you can substitute your own capacitor and inductor in parallel for testing. The other thing that you can do is build a Excel spread sheet or Bob has one on the ARRL website. Hope you enjoy this project as much as I have?